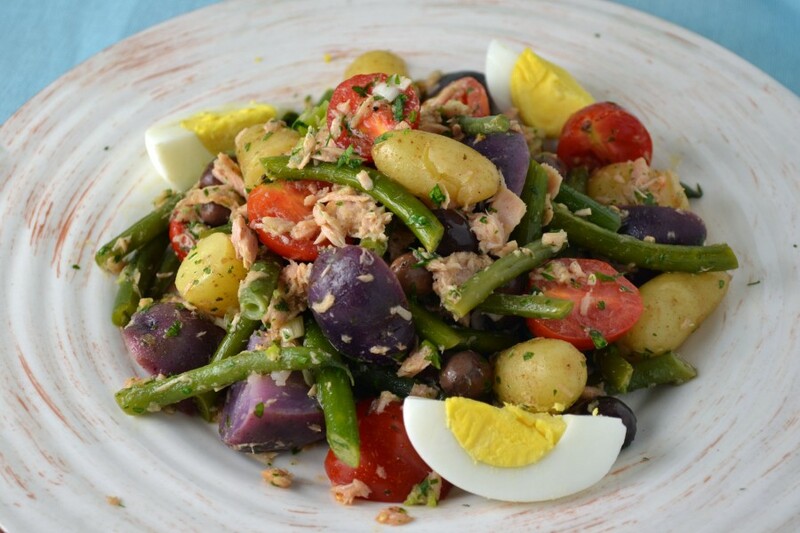 With so many variations of salad nicoise these days, it’s difficult to decipher which are authentic and which are simply tasty tuna vegetable salads. This summery French dish is said to have originated in Provence, a region along the Mediterranean Sea often known for its Italian Greek-like Mediterranean style cuisine, which includes more of an emphasis on vegetables and fruits. The contents of an authentic Salad Nicoise are debated. Should it include boiled potatoes? Cucumbers? Capers? Green Bell Pepper? Should it have canned tuna or fresh tuna? Anchovies? Then it must be decided if it should be served as a composed salad (aesthetically arranged on the plate) or mixed all together. Maybe this salad has evolved so much that there are no longer any rules. Perhaps the only thing that matters (besides a delicious final salad), is that it includes Nicoise olives – after all, that is what the salad is named after. But even that can be disputed due to availability nicoise olives in the US (black olives are often substituted). My version of Salad Nicoise doesn’t follow any of the rules. I wanted a really good salad and simply used the French version as an idea or base. This salad is a combination of my grandmother’s recipe from “The Art of Good Cooking,” my mother’s version which was really my first introduction to Salad Nicoise, and the more by-the-book version I was taught in French Culinary School. I also used earthy purple Peruvian potatoes, cherry tomatoes instead of sliced, and added garlic scapes. If you haven’t experienced garlic scapes, I encourage you to hunt them down at your local farmers market asap. These spicy curly stems can be cut in 1-inch pieces and boiled or steamed. After they are cooked, they look similar to the green beans (unless you are using the traditional haricot vert) but they add a mild garlic surprise to this easy salad exploding with different flavors and textures. This is one of the best ways to take advantage of prime produce season and enjoy the last of those hot summer days. Bring a large pot of water to a boil. Meanwhile halve or quarter potatoes. Salt the water and add the potatoes. Boil 20-30 minutes or until tender. Drain. While potatoes cool, make the vinaigrette. Whisk together vinegar, oil, mustard, salt, and pepper until emulsified. Pour about half the vinaigrette over warm potatoes and toss to combine. Chill potatoes. Bring another large pot of water to a boil. Add salt, green beans, and garlic scapes. Boil for about 5 minutes until just barely tender. Drain and chill. 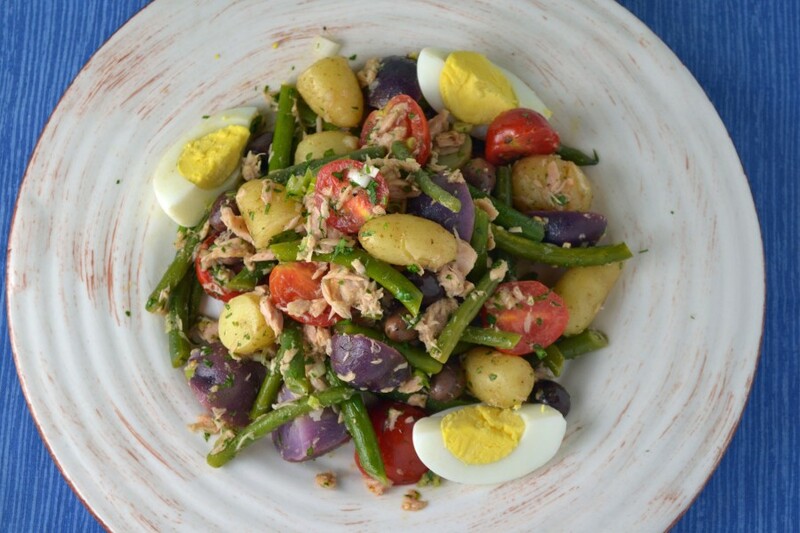 In a large bow, combine cooked potatoes, green beans, garlic scapes, tuna, tomatoes, scallion, parsely, and Nicoise olives. Dress with remaining vinaigrette. Season with salt and pepper. Toss to combine. Serve with hard boiled egg slices.